In just two decades, Russian cuisine has gone from drab post-Soviet leftovers (think mayonnaise and salted fish) to a world-class tradition that’s beginning to turn heads. One of the most energetic figures behind this New Russian cuisine is chef Vladimir Mukhin. His restaurant, White Rabbit, located at the top of a 16-story skyscraper in Moscow, is on the “World’s 50 Best Restaurants” list. 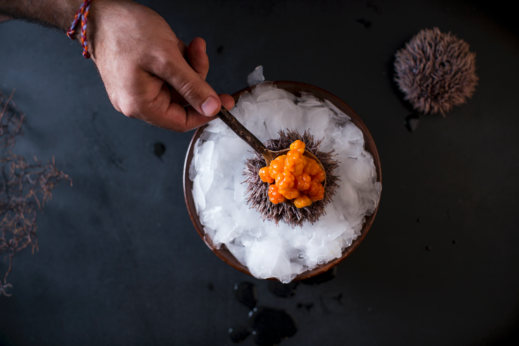 Taking pre-revolutionary recipes as his inspiration, he set out to, in his own words, “show the world that Russian food exists.” Think moose milk ice cream, cabbage baked in a wood-fired oven with champagne-caviar sauce, and ravioli with Kamchatka crab. Of course, having a special relationship with food means having a special relationship with farmers. When the farmer who grows Mukhin’s cabbages called, crying and saying that the harvest had frozen, Mukhin came up with a new way to cook the cabbage. Meanwhile, the farm where he gets his moose meat and milk is starting to expand. Mukhin’s appetite for high-quality and exotic products (he now has more than 20 restaurants in the White Rabbit family) is creating demand for farmers all over Russia. Today, New Russian cuisine goes hand in hand with the farm-to-table movement. If you think of Russian food at all, chances are, you think of beet soup, salted fish, caviar and salads smothered in mayonnaise. But you won’t find those in Mukhin’s kitchen. “People consider me to be a fighter against mayonnaise,” he says with a healthy dose of pride. 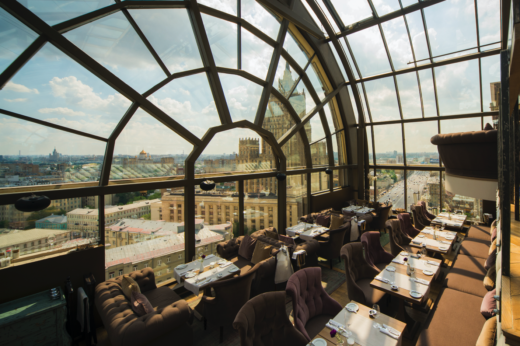 He is tucked into one of the tables on the lower level of White Rabbit restaurant, overlooking the evening Moscow skyline. Mayonnaise, which Mukhin abhors, is one of the enduring symbols of Soviet food. The calorie-rich spread was mass-produced by order of the Soviet government and used wherever possible, at home and in the ubiquitous stolovoya (cafeteria). Mayonnaise glued together pickled herring and beetroot salad, spoonfuls of mayonnaise were ladled into borscht instead of sour cream, and whitefish was baked with mayonnaise and onions. And mayonnaise is just one such example; Soviet food was standardized and mass-produced to feed the working masses, and high cuisine was disdained as bourgeois. But Russian cuisine wasn’t always fatty and homogenous. Before the Russian Revolution of 1917, the country was known for sturgeon, mead, wood-fired vegetable pies and cheeses. Today, that history is coming back. White Rabbit currently ranks 15th on the “World’s 50 Best Restaurants” list. It was featured in the Netflix documentary Chef’s Table and has attracted the attention of food connoisseurs from around the world. On the menu is everything from Kamchatka crab (which greets you in a waterfall tank at the entrance to the restaurant) to fried radish with sour cream and pike caviar to wild boar cutlets with lobster sauce. Mukhin’s success isn’t just changing the face of Russian restaurants and the reputation of Russian cuisine globally; his appetite for high-quality products is influencing farming as well. Russia had collective farms during the Soviet period, but demand from restaurants like White Rabbit is helping to create a market for a new generation of farmers and a model of food production where chefs and farmers share an intimate connection. “Today, a chef isn’t just someone who cooks,” says Mukhin. “It’s someone who grows products for himself and coordinates with farmers.” Dissatisfied with the tomatoes available on the market, the chef has spent almost two years working with a farmer on the Volga River to develop better tomatoes for his restaurant. He has also partnered with a moose farm, which inspired him to recreate an old recipe that calls for moose lips and serve salted caramel moose milk ice cream. The farm is starting to expand and release young moose calves back into the wild. Just as important to Mukhin is where his vegetables come from. One of the more pleasant surprises on his menu is a wedge of cabbage, baked in a wood-fired oven and drizzled with a champagne-caviar sauce (black caviar, salmon caviar and pike caviar). The velvety softness and sweetness of the cabbage are puzzling at first yet utterly delicious. Turns out, when farmer Svetlana Ivanova called in tears to tell Mukhin that her entire crop of cabbages had frozen, he told her to bring them to the restaurant anyway. He had an idea: The parts of the cabbage that had frozen would be sweeter when baked. It turned out to be a wild success. “For me, cabbage is the Black Square of 2018,” he says. Black Square is a futurist painting by Russian artist Kazimir Malevich. Mukhin believes that food can — and should — be art, and he believes that vegetables are the future of the art that is food. In the end, Mukhin is not unlike mayonnaise himself. “I’m like glue,” he says, “like a wallpaper glue that sticks talented people together.” His young team is the most important part of his restaurant. “I live for their sake,” he tells me, adding that the next generation of Russian chefs will be even stronger than this one.